Yes, we admit it….we were originally biased against Pittsburgh, PN, but we have seen the light! Join us as we explore one of the coolest and livable(?) cities in the country! Pittsburgh is the 63rd-largest city in the U.S, a tech mecca, and a must-see destination. Find out more about one of the “Best Places to Travel. 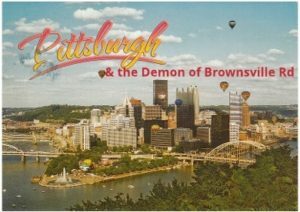 We have a great interview with Bob Cranmer, author of The Demon of Brownsville Road. He shares some truly terrifying details of his twenty years in the infamous Demon House. We have all the inside information on Randyland, a place Anthony Bourdain said is essential for the “Perfect Day in Pittsburgh”. Brett has some deep breakthroughs about his youth in the Catholic Church. Apparently they are perfect for renovating into world class restaurants. We have classed up the Top 5 and the guys at the Project Archivist Show called us with a heart-melting voicemail.